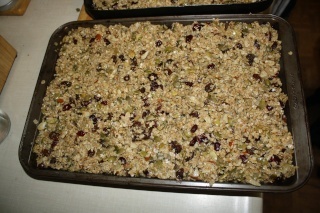 In a large bowl, stir together the oats, almonds, walnuts, pecans, sesame seeds, wheat germ, coconut and sunflower seeds. In a small pan over medium heat, stir together the oil and honey. Cook and stir until blended. You could also do this in a large measuring cup in the microwave, heating for about 2 minutes and 30 seconds. 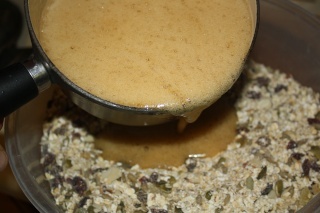 Pour over the oat mixture, and stir to coat evenly. Spread out in an even layer on two cookie sheets. 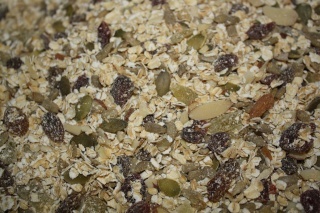 Bake for 20 minutes in the preheated oven, until the oats and nuts are toasted. Immediately after it comes out of the oven, stir in the raisins and dried cranberries. Let stand until cooled, and stir again to break up any large clusters. Store in an airtight container at room temperature for up to two weeks, but I guarantee it won't be around that long! So, sort of like bits of really nice flapjack...? Awwww Badger, your granola takes me back... I used to make it too, years and years ago, and it was so scrumptious. It never lasted very long, you're right about that! If I made some now, it would have to be a different version, as some of the ingredients you use are prohibitively expensive here (dried cranberries, dried kiwi, pecan nuts, to name just three). But substitutes can be found! Kiwis dry very well in a dehydrator, Snoops. As do cranberries - we have never managed to grow the latter but always buy up all the discounted ones immediately after cChristmass and dry them for the year. One of these days I might get a dehydrator But I am trying to downsize in the kitchen equipment department. Still, good to know about kiwis. Cranberries are always very expensive here - on the rare occasions you can get them, never discounted, Christmas or not. Snoopka wrote: Awwww Badger, your granola takes me back... I used to make it too, years and years ago, and it was so scrumptious. It never lasted very long, you're right about that! Snoopka wrote: One of these days I might get a dehydrator But I am trying to downsize in the kitchen equipment department. You can achieve the same effect using an oven on the lowest setting with the door cracked open. Or a simple solar dehydrator if you live somewhere hot and sunny. We have not had huge success with our kiwi plant either. It is prolific - regardless of pruning it grows up beyond the upper windows of the house on a south-facing wall but the claims the leaflet made of dozens of kilos of fruit a year have yet to be realised. ooh, thanks Badger! 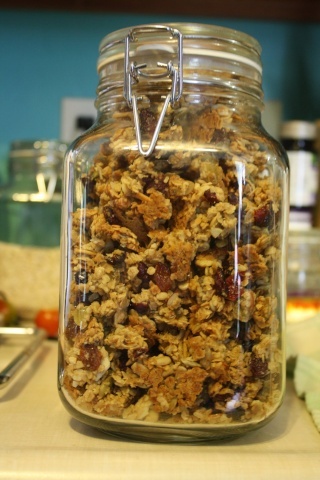 I've just finished eating my first HUGE batch of home-made granola, which came out a bit too sticky and soft, so will try your recipe next. Certainly looks a lot better than mine turned out!